Most people believe that they don't like talking about death. Regardless of this, you'd be surprised at how many lengthy, meaningful, and constructive conversations we've had with perfect strangers who had just discovered that our family builds caskets. Sometimes it's questions revolving around the concept of "can you do that"? Most of the time the stranger launches into a story about a particularly unique funeral experience. So our society is afraid of talking about death? Maybe we're afraid of our own death, but we certainly don't hold back all of our feelings on death. The burial is easier...until it's time to actually plan it. 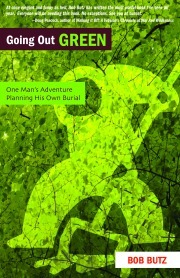 A few years back, Bob Butz, author from the Traverse City Area, was approached by his publisher to essentially plan his own burial and write a book about it. His book is a very open, human (including humor, disgust, and fear) journey into the feared task of taking care of one's body after death. Most of us have the luxury of leaving the final details of our burial for the living. Bob went through it all, including his final task of physically digging a grave in his own back yard. Of course, you should have the funeral that you want. But if you wish to discover what this means, you have to learn about the options. Have you been updating your own funeral plans yearly, as you've recommended in your book? My big problem has always been in deciding where I’d like to be buried. Where do my bones belong…if anywhere? And does it really matter? Logistically, not much has changed since finishing Going Out Green. Michigan funeral law is still the same. The friends needed to carry out my plan are all still on this earth. But it’s the where—and that’s really a major thing—that I have yet to decide on. Based on your research, does Michigan have more or less flexibility than other states when it comes to planning a funeral? Green burial advocates have long been in agreement that Michigan has the least flexible funeral laws in the nation. The Funeral Consumers Information Society is spearheading an effort to change that and they deserve the support of anyone who believes people should have the right to care for their own dead. Are you aware of the Traverse City area green cemetery plans/development? With green burial featured more in the news, a lot of people think that opening a green burial preserve could be a wonderful money maker. I’ve talked to people who believe this and others who come at it with more noble intentions, those who would like to protect land while also offering a “green alternative” to people shopping around for their final resting place. In this area, I’ve heard of more than a few people who were interested in starting a green cemetery. But, as far as I know, no one has actually “broken ground” yet. But that’s not surprising given the hard reality of the paper work, the surveying fees, real estate costs—running and maintaining a green burial preserve is actually very expensive. You approached your funeral research with a refreshing lightheartedness. Did you receive any bad press because of this? Not at all. I wrote Going Out Green with the goal of crafting a narrative that was entertaining and informative. My goal was to craft a story, in the form of a weekly serial, that would be accessible and interesting to anyone—even if you didn’t specifically pick up the book because of an interest in green burial. And I think the book succeeds. How many funeral directors did you talk to during research for your book before you found one willing to help you plan the funeral of your choice? More than I can remember and I haven’t found one yet. There are plenty of funeral directors out there who will help someone carry out a green burial in Michigan. I just haven’t found a funeral director yet who I would call a friend and, frankly, I would prefer to not have a stranger enter the picture at this final phase. I want someone there who knew me and my family—someone I have a connection to, no matter how small—or I would prefer to have no one at all.